Ivysaur is a playable character in the Brawl mod Project M. Like Charizard and Squirtle, she has been separated from the Pokémon Trainer and so fights alone. Her down special move, Pokémon change, has been replaced with Seed Bomb and she has also been given significant buffs. Ivysaur ranks 28th out of 41 on the official tier list, toward the midst of the C tier, roughly the same placement as Pokémon Trainer in Brawl. However, as Ivysaur was considered near-useless as a standalone character in Brawl, this is a significant increase in apparent viability. In the transition to Project M, Ivysaur was significantly buffed and modified to function as a mid-range zoning and anti-air character. She no longer depends on the Pokémon Trainer, losing her stamina system and crippling weakness to fire moves. She now also fights with self-healing moves and status effects befitting the Grass/Poison typing she has in her home series. Ivysaur's ground moves have all received buffs. Her up-smash remains the most powerful in the game and comes out more quickly, making it a more viable KO option, and her down-smash is a strong semi-spike useful both for relieving pressure and for edgeguarding. All of her other ground moves were reworked for speed and combo potential, and her jab now consists of two strong hits useful for keeping foes at a distance. In the air, Ivysaur's buffed air speed gives her greater mobility for combos. Combined with her new combo option in neutral-air, her reworked forward-air designed for wall of pain combos, and her back-air – formerly one of the worst moves in the game – which can easily gimp foes offstage, foes approaching from the air are at significant risk of being comboed or simply pushed offstage. Her up-air now shoots her to the ground faster, and her down-air provides enough of a momentum boost to serve as a much more reliable tool for horizontal recovery; when used offensively with Ivysaur's new air speed, they can also serve as a juggling move and an offstage meteor smash, respectively. Synthesis, her new neutral special, allows Ivysaur to heal herself for as long as the special button is held down, and its slight ending lag can be landing-cancelled. This gives Ivysaur a completely unique camping option, as some characters that rely on projectiles to force an approach can be outplayed if Ivysaur can heal herself quicker than damage can be tacked on. Characters like Falco who have reliable flinching projectiles can still lock down Ivysaur from a distance, but Ivysaur can easily force an approach from slow or non-flinching zoners like Toon Link and Fox, as Synthesis is nearly sufficient to outpace the damage they deal. Even if Ivysaur cannot completely undo damage received while using Synthesis, the move can force an approach anyway because it also charges up Ivysaur's second neutral special. Once she heals 22 percentage points of damage, Ivysaur's next neutral special will become a one-time SolarBeam, a long-ranged energy beam that travels at a 45º angle from Ivysaur's bulb all the way to the upper blast line on most stages. With a SolarBeam, Ivysaur can deal a powerful finishing blow to opponents otherwise out of reach, and the move's lingering hitbox can stick around if the target airdodges too early. However, a SolarBeam charge can also serve as an effective zoning threat, as the glow of a full charge is easily visible to opponents. As a result, opponents aware of the charge will often try to recover low or approach in ways that don't put them at risk of being hit, enforcing predictable behavior that the player can take advantage of. Ivysaur can alternatively heal herself and charge SolarBeam through some direct attacks, like her pummel (1%), up-throw (6%), and the sweetspots on her up-smash (9%), up-air (7%), and down-air (7%). The latter four will also flower any opponents they hit, and outside of her up-smash, they can all chain into themselves reliably. 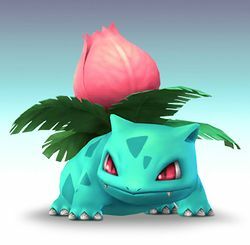 Using these moves in quick succession can self-heal Ivysaur at a startling rate while also building the rate of damage the flower deals, often forcing the target to button-mash and remove the flower instead of readying a counterattack. Razor Leaf was reworked for consistency and combo ability, giving Ivysaur a more reliable mid-range projectile, while Vine Whip's buffed damage and speed let it function as a great KO option out of a down-throw or even to punish foes on platforms. Ivysaur's new down-special, Seed Bomb, is perhaps her best tool to keep foes in the air; as the projectile rises higher, so does its knockback, which serves the same purpose as her forward-air in steadily walling foes to the blast line. Additionally, Seed Bomb has awkward but effective potential for zoning on the ground, as it will stun any foe it lands near, providing opportunities for punishment. Despite Ivysaur's numerous buffs, she still has some weaknesses from Brawl that can be exploited. Ivysaur's power and flexibility in mid-range situations do not extend to close-range or long-range fights. Ivysaur's moves all have some startup that close-range combatants can take advantage of, especially out of shield, while Razor Leaf and Seed Bomb aren't enough to reach ranged fighters. While previously a middleweight in Brawl, Ivysaur is now a lightweight, worsening her survivability and forcing her to use her self-healing moves to stick around. Her grab, while still as laggy as before, was shortened, making setups off of her throws much harder to achieve. Despite Project M's improved tether recovery mechanics, Ivysaur can still be knocked out of a Vine Whip mid-animation. However, if players can consistently keep foes at mid-range or in the air, Ivysaur's plethora of combo and KO options can easily carry her to victory. In Brawl, Ivysaur was tied to the Pokémon Trainer and was considered the worst out of the three Pokémon and it was even considered a contender for the worst character in the game when judged as a standalone character. As a result, Ivysaur was buffed greatly from Brawl to PM. Ivysaur is no longer tied to the Pokémon Trainer and its moveset has been heavily revamped. Many of Ivysaur's biggest weaknesses including its abysmal aerial game and recovery have been greatly improved. All of Ivysaur's aerials have seen many improvements in different areas and its air speed has been increased granting it a much stronger aerial game. Vine Whip is stronger, has more range and it can no longer be edgehogged making Ivysaur's recovery much less exploitable especially when combined with its higher air speed and the introduction of directional air dodging. Many of Ivysaur's attacks have seen either improvements to their speed or power and Ivysaur now has a new very powerful tool in its kit with its Solar Beam which has replaced Bullet Seed. Ivysaur can now synthesise to build up charge for its Solar Beam. It can do this by either using its neutral special to slowly build it up or to land attacks which involve its bulb including its up smash, up throw, up and down aerials and pummel. All these attacks now heal Ivysaur and they all have a flower effect to further increase their damage output (although up smash, up aerial and down aerial require landing a sweetspot to perform this). Once the Solar Beam has been fully charge, Ivysaur can release a devastating beam which deals 25%, crosses the entire screen and has very high KO power giving it incredible KO and edgeguarding potential. Despite these huge buffs, Ivysaur also received a few nerfs. Ivysaur is much lighter greatly hindering its endurance. Its KO moves including the afforementioned up smash and up aerial are far less consistent due to receiving sourspots (although those moves have seen significant buffs in other areas and they still have excellent KO power when sweetspotted) while moves such as forward smash, forward aerial and up throw have reduced KO potential. This is especially poor as killing was already one of Ivysaur's weaknesses although this is compensated with Solar Beam. Ivysaur's zoning is also weaker in some ways as its back aerial is slower and has less range while Razor Leaf is slower and only one leaf can be out at a time. Lastly as it is no longer apart of the Pokémon Trainer, Ivysaur cannot switch out with Charizard or Squirtle to cover up its poor matchups. Overall, Ivysaur is far superior to its Brawl incarnation and is significantly more viable in competitive play than the Pokémon Trainer despite still being in the lower half of the tier list. New on-screen appearance: Ivysaur unplants itself from the ground. Pokémon Trainer victory pose has been removed. Ivysaur has many new alternate costumes. Ivysaur's air speed is higher (0.752 → 0.88) improving its recovery and aerial approach. Ivysaur is significantly lighter (100 → 85), drastically worsening its horizontal endurance. This also makes Ivysaur invulnerable to Fox's waveshine combos. Ivysaur's fall speed is higher (1.35 → 1.7) though it is lower relative to the cast. Ivysaur's gravity is slightly higher (0.07 → 0.075). Ivysaur's traction is higher (0.0532 → 0.06). This makes it easier for Ivysaur to punish out of shield but reduces the distance its new wavedash covers. Ivysaur is no longer tied to the Pokémon Trainer. Because of this, Ivysaur is no longer affected by stamina or type effectiveness meaning that Ivysaur no longer takes additional knockback from fire attacks nor does its attacks get weaker over time. However, this also removes Ivysaur's ability to adapt to different matchups by switching to Charizard or Squirtle. Jab combo has more range, the second hit deals more damage (2% → 4%) and both hits have less startup lag (frame 7 → 2 (hit 1), frame 8 → 6 (hit 2)) and deal more knockback. The first hit also has less ending lag (frame 28 → 16). Ivysaur no longer has a rapid jab hindering jab's damage racking potential. The first hit also has a shorter duration (frames 7-10 → 2-4). Dash attack has a new animation where Ivysaur break dances. This gives it less ending lag (frame 44 → 35) which when combined with the removal of hitstun canceling, improves its combo potential. Forward tilt links much better and has less startup (frame 6 → 5) and ending lag (frame 42 → 36). Forward tilt deals slightly less damage (14% → 13%). Up tilt has a slightly longer duration (frame 9-14 → 9-15) and deals more damage (7% → 9%/8%). Up tilt has more ending lag (frame 35 → 36). Down tilt has more range and does slightly more damage at the tip (2% → 3%) It also has less ending lag (frame 38 → 32) and both hits have a longer duration (1 frame → 2 (frames (hit 1), 4 frames (hit 2)). It also has more range and the second hit launches opponents vertically granting it combo potential. Down tilt has more startup lag (frame 4 (hit 1), frame 9 (hit 2) → 8 (hit 1), 12 (hit 2)). Forward smash has less startup lag (frame 17 → 15) and can now be angled. Forward smash deals slightly less damage (16% → 15%) hindering its KO potential. Up smash has dramatically faster startup (frame 26 → 13) and ending lag (frame 60 → 47), and has a sweetspot which has a flower effect increasing its maximum damage output (17% → 24%) and heals Ivysaur. Up smash's clean hit deals less base damage (17% → 9%) and while its knockback growth was compensated (90 → 150), the universally increased falling speeds hinder its KO potential. It also now has a sourspot with a grass effect which deals less damage (17% → 12%) and knockback (80 (base), 90 (scaling) → 50/100) and sends opponents at a less vertical angle. Down smash has less startup (frame 16 → 10) and ending lag (frame 64 → 48), does much more damage (8% → 14%/12%) and knockback, and has a semi-spike angle. Neutral aerial has a bigger hitbox that connects much better and deals more damage (14% → 16%) and has higher knockback. Neutral aerial has more ending (frame 41 → 42) and landing lag (11 frames → 14). Forward aerial's sweetspot deals slightly more damage (12% → 13%) and forward aerial has less ending lag (frame 51 → 35) which when combined with the removal of hitstun canceling greatly improves its follow-up potential. It also has less landing lag (28 frames → 19). Forward aerial's sourspot and sweetspot have been swapped around. This makes forward aerial a stronger spacing tool but makes the sweetspot harder to land. Forward aerial deals less knockback especially the sourspot which deals less damage (10% → 9%). Back aerial deals significantly more damage (2% → 4% (hit 1), 2%/3% → 5%/7%/8% (hit 2)) and has much more knockback giving it stronger gimping potential. It also has less ending lag (frame 46 → 41). Back aerial has more startup lag (frame 4 (hit 1), 13 (hit 2) → 7/17), landing lag (10 frames → 17) and has less range. Up aerial has less startup (frame 12 → 9), ending (frame 53 → 36) and landing lag (22 frames → 21). It also shoots Ivysaur to the ground faster, has a sweetspot with a flower effect making it deal more total damage (16% → 18%), deals slightly more knockback and heals Ivysaur. It now has a hitbox during Ivysaur's descent which can lightly meteor smash, greatly increasing its safety and making it a strong landing option. Up aerial now has a sourspot which deals much less damage (16% → 10%) and knockback and the sweetspot deals less base damage (16% → 7%). Down aerial has less startup lag with a longer duration (frame 11 → 8-10) and has less ending (frame 64 → 48) and landing lag (28 frames → 24) and it now auto-cancels in a short hop. It also gives Ivysaur a momentum boost rather than halting all of Ivysaur's momentum allowing it to aid Ivysaur's recovery, and both the sourspot and sweetspot are much stronger and the sweetspot now has a flower effect greatly increasing its damage output (8% → 20%) and it also heals Ivysaur. Grab range has been reduced, now just being of a slightly-above-standard range rather than acting as an extended grab. Ivysaur's standing grab also has more startup lag (frame 13 → 14). Dash grab has less startup lag (frame 13 → 12). Pummel deals less damage (3% → 1%) and has more ending lag (frame 25 → 28). Back throw deals more damage (10% → 11%). The universally decreased falling speeds and the removal of hitstun canceling grant up throw and down throw combo potential. Up throw now has a flower effect increasing its overall damage output (10% → 17%) as well as healing Ivysaur. Up throw deals less base damage (10% → 6%) hindering its KO potential. Ivysaur has a new neutral special: Synthesis and Solar Beam. Synthesis has a weak hitbox with set knockback on startup and holding the special button slowly heals Ivysaur and builds up charge. Charge is shown as a glowing light in Ivysaur’s bulb that grows bigger and fills the bulb when fully charged. Once the charge is full, using the move fires a powerful energy beam diagonally upwards. It can also be charged by connecting with Ivysaur's bulb attack sweetspots (including up smash, up throw, up and down aerials and pummel). Compared to Bullet Seed, Solar Beam is a much more powerful KO move/edge-guarding tool and has much more range. Solar Beam also has intangibility. Compared to Bullet Seed, Solar Beam has more startup lag (frame 4 (initial hit), frame 16 (seeds) → 20) and it cannot be held greatly reducing its maximum damage output (60% → 25%) and duration (6 seconds → frames 20-41). It is also worse for catching landings if the opponent is directly above Ivysaur and Solar Beam leaves Ivysaur helpless if used in the air. Razor Leaf has a longer duration (frames 22-69 → 22-74), and it can now hit multiple targets and deal damage consecutively. It additionally flies in the same straight path instead of randomly angling, making the move more consistently usable. Razor Leaf travels much slower covering a significantly shorter distance and it now deals consistent damage (8% (near), 6% (mid), 4% (far) → 3%). It also vanishes upon making contact with a surface, worsening its overall durability, and only one Razor Leaf can be out at a time. Vine Whip's sweetspot is stronger, dealing higher damage (13% → 15%) and knockback. Vine Whip also has more range and can no longer be edgehogged due to Project M's new tether mechanics. Vine Whip now plays the ping SFX if the sweetspot connects. Ivysaur has a new down special: Seed Bomb, which sends a powerful projectile vertically similar to Snake's up smash. It releases Stun Spores upon hitting the ground, which stun opponents in range. The move can also be angled left or right slightly. It's great for both punishing aerial approaching foes and catching grounded enemies off-guard. Compared to Pokémon Change, it has much less ending lag (>frame 120 → 58) making it far less punishable. Unlike Pokémon Change, Seed Bomb does not grant Ivysaur intangibility nor does it reset stale move negation. Ivysaur has a new Final Smash Sunny Day. Ivysaur synthesises, heals 66% damage and gains access to three fully charged Solar Beams. Forward tilt links more reliably and has slightly less range behind it. Up smash sweetspot's shield damage is increased. Down smash start-up is faster. Neutral air hitbox size increased, landing hitbox better for comboing. Standing grab and pivot grab have slightly increased vertical range. Down tilt second hit sends at an upward angle,which can lead to many follow-ups. Grab pummel deals slightly less damage. Razor Leaf (projectile) does less damage per hit. Jab range is better overall while Jab 1 IASA is worse. Dash Attack animation is faster, strong hit duration is shorter. Forward air downward range decreased; animation slightly faster overall; all hits send opponents vertically. Back air damage/knockback decreased on ranged hits; angles generally higher; animation faster overall. Up air falling hitbox is a spike for the first four frames while shield damage is added to bulb sweetspot and can no longer fastfall during up air to slow decent. Down air has a faster start-up but greater endlag, shield damage added to sweetspot and can skip to a 3rd+ "float" effect by holding down during start-up. Dash grab has significantly reduced horizontal range, significantly less endlag (like the average jump cancel grab), and has noticeably increased vertical range. Synthesis/Solar Beam when uncharged now has a landing cancel, healing starts later in the animation, and holding B to full charge allows you to continue healing until you let go of B.
Solarbeam now takes 22% to fully charge. Charged Synthesis/Solar Beam transition to Special Fall can now grab ledges backward. Razor Leaf animation is faster all around, Razor Leaf stays out longer, no longer decelerates over time, but is limited to one leaf on-screen at a time and can now be fastfalled. Vine Whip's sweetspot hitbox size decreased, grounded Vine Whip now matches aerial Vine Whip (has an extra active frame). Fixed a glitch where the Vine Whip's "hop" wouldn't happen immediately after hitstun. Seed Bomb can be angled to the left or right (less so while in the air), aerial Seed Bomb no longer pushes Ivysaur downward. Forward tilt back hitbox and the innermost front hitbox have increased SDI multipliers. Forward air damage increased by 1%. Back air send off hits have increased base knockback, and the inner trajectory has been lowered. Back air outer hitbox damage increased to 5%. Down air damage increased and homogenized against grounded and aerial targets to 7%. Back throw knockback growth increased. Down throw knockback growth increased. Vine Whip's sweetspot hitbox size slightly increased. Vine Whip's sweetspot damage increased to 18%. Up throw knockback growth decreased,so it makes it easier to go for a back aerial at higher percents. Up throw angle increased to send slightly behind Ivysaur,which perfectly sets up a back aerial gimp. Neutral air final hit knockback growth decreased,which makes it more reliable for repeated hits,or follow-ups. Fall speed slightly increased, and fastfall speed increased. Forward tilt's back final hitbox damage decreased to match earlier weak hits. Down air ending lag increased. Down air sweetspot size decreased, with the sweetspot deeper inside Ivysaur. Forward throw knockback lowered to match v2.6 back throw. Seed Bomb seeds rise slower, do not go as high, and fall more slowly as well. Increased aerial drift strength and decreased aerial friction. Down tilt's 2nd hit now only pops up at the outer 2 hitboxes instead of outer 3 hitboxes. Forward air hitbox angles have been noticeably lowered to send further horizontally. Forward air base knockback increased, knockback growth decreased. Back air closer endlag mostly reverted to v2.5. Still allows a small window to short-hop Back Air autocancel. Up air sweetspot knockback growth and damage increased. Hitbox size decreased, with the sweetspot deeper inside Ivysaur. Sourspot angle decreased. Up air no longer halts horizontal momentum on fall. Up air meteor hitboxes redone - now two side-by-side hitboxes that maintain horizontal coverage with negative disjoint on the bottom. Grabs - outer 2 of 5 boxes on standing and pivot grab + outer 1 box of 3 on dash grab are ground-only to alleviate chain grab issues. Synthesis/Solar Beam startup hit is now a relatively weak wind box. Synthesis/Solar Beam max charge lowered from 22% to 18%. Aerial Synthesis/Solar Beam land-cancels only if the Special Button is not held. Razor Leaf checks if existing leaf is out on frame 1 instead of 15. Razor Leaf hit refresh rate is slower, damage per hit is increased by 1, and hit angle is increased to send further vertical. Razor Leaf is slowed down to v2.5 timings while float physics are also reverted to v2.5, but the move lasts 5 frames longer. Up air non-L-canceled landing lag value decreased slightly. Jab 1 and jab 2 had a chance to cause a trip, this has been removed. Ivysaur has a new final smash. Second hit of back aerial deals more damage at the center rather than at the tip. However, it deals less base knockback. Up throw now heals 3%. It now causes less damage. Forward throw does less damage. However, its knockback has increased. Vine Whip deals less damage. Solar Beam takes longer to fully charge. Ivysaur receives a new black palette swap. Fixed a visual bug that made two vines appear on Vine Whip if Ivy had tethered to a ledge at least once. Dash Attack has been given a new animation to differentiate it from running and dashing, in which Ivysaur does a full-bodied lunge. Hitbox and distance properties function the same. Added vine motion trails to jab, d-tilt, d-smash, f-air, and b-air. Forward tilt now has 5 hits instead of 4 and pulls inward. Removed final hitbox behind Ivysaur. Up throw now Charges/heals 6 points instead of 3. 3% Ivysaur strikes with one vine, followed by another vine that deals stronger horizontal knockback. 2% (hits 1-4), 5% (hit 5) Ivysaur leans forward and spins the leaves around her main bulb like a helicopter blade, hitting multiple times. This move can be aimed up or down. 9% (center), 8% (sides) Ivysaur plants her vines on the ground and pushes herself into the air. Has good range, with the central hit dealing straight vertical knockback. 2%-3% (hit 1) , 5% (hit 2) Ivysaur whips two vines quickly along the ground, hitting twice with good range. The first hit has set knockback when hitting at the tip. The second hit has either horizontal knockback if it hits at the center, or drags foes towards Ivysaur if hitting at the tip. 12% (clean), 10% (late) Ivysaur lunges and tackles the foe. Connecting during the early part of the animation deals powerful base knockback. 15% Ivysaur plants her vines on the ground and launches her body forward. Decent knockback (30 base, 100 growth); can be used for edgeguarding onstage. Can be angled up or down. 9% (body), 12% (explosion) Ivysaur launches a burst of spores from her bulb. The lateral hitboxes deals strong vertical knockback, while the explosion deals more damage, less knockback, flowers the enemy, and heals 9% to Ivysaur. The percentage healed also increases with the attack's charge, for a maximum of 12.3039% when fully charged). 14% (center), 12% (tip) Ivysaur quickly whips out vines across the ground simultaneously on both sides. Has a semi-spike trajectory akin to Jigglypuff's down smash. 2% (hits 1-6), 4% (hit 7), 3% (landing) Ivysaur spins while facing diagonally downwards. Hits multiple times with the last hit dealing minor knockback. 9% (center), 13% (tip) Ivysaur slaps forward with both vines. Has some start-up, but the tip is powerful, while the center can set up combos at low percentages. 4% (hit 1), 5% (hit 2 near), 7% (hit 2 mid), 8% (hit 2 far) Ivysaur spins vertically and hits backwards with her two respective vines. The second hit has a semi-spike angle that can easily gimp recoveries. 7% (bulb interior), 10% (explosion), 6% (descent) Ivysaur shoots a burst of spores out of her bulb and propels herself downward. The bulb interior flowers the opponent and heals 7% to Ivysaur. The descent weakly meteor smashes enemies and can be quickly L-canceled for follow-ups. Ivysaur starts fast falling as soon as the move is executed. 7% (bulb interior), 10% (explosion) Ivysaur turns upside-down and shoots a burst of spores out of her bulb. Similar to her up aerial, but deals slightly less knockback. The regular hit has a more horizontal trajectory for gimps, while the bulb interior powerfully meteor smashes the opponent in addition to flowering them and healing 7% from Ivysaur. The move completely stops Ivysaur's descent, and its quick animation can be combined with Ivysaur's fast air speed to provide a good horizontal recovery option. — Stretches Ivysaur's vines and binds the opponent. Has shorter range compared to other extended grabs, but less ending lag. 1% Squeezes the opponent. Heals 1% to Ivysaur every time it is used. The amount charged or healed accounts for stale-move negation. 10% Ivysaur tosses the foe forward with her vines. 11% Ivysaur spins, then tosses the foe backwards with her vines. Higher base knockback and knockback growth than the forward throw, and a more horizontal angle. 6% Ivysaur puts the foe over her bulb, then bounces them into the air with it. The move charges and heals 6 points every time it is used and will flower opponents. Can chaingrab fastfallers. 10% Ivysaur does a flip and slams the foe into the ground with her vines. A good throw for chaingrabbing fastfallers. At higher percentages, or against other characters, it can lead into an aerial, a Vine Whip, or SolarBeam. 6% Ivysaur get up with a horizontal spin, swinging her vines. 6% Ivysaur gets up and strikes both sides with her vines. 5% Ivysaur stands up and hits both sides with her vines. 6% (close), 8% (far) Ivysaur climbs onto the stage and swings a vine. 10% Ivysaur slowly climbs up and delivers a quick headbutt. Synthesis/Solar Beam 4% (charge), 25% (SolarBeam) Holding the special button heals Ivysaur of approximately 1% damage per second and builds up bulb charge at the same rate. The charge start-up produces wind. Once the charge is full, using the move fires a powerful energy beam diagonally upwards, having great range and dealing strong knockback, serving as a powerful edge-guarding attack or combo finisher. To fully charge the beam from the start, Ivysaur must have 22% or more damage healed, either by the move itself or by bulb attacks and pummel. The SolarBeam has an electric effect and cannot be reflected, but can be absorbed by PSI Magnet and Oil Panic. Ivysaur becomes helpless after firing the beam. Razor Leaf 3% each hit Ivysaur fires a spinning leaf forward, which hits enemies consecutively when used as a tilt and hits once when thrown as a smash attack. The leaf can be reflected, but cannot be angled and vanish upon hitting a surface, and can pass through foes and shields. Vine Whip 11% (base), 15% (tip) Ivysaur shoots a vine diagonally upwards. The sourspot can be easily used for repelling airborne enemies or edge-guarding onstage, while the sweetspot deals high knockback that can yield KOs at low percentages. In midair, it gives Ivysaur a boost upward, and acts as a tether recovery. Seed Bomb 10% Ivysaur fires a flashing seed upwards in a motion similar to its old neutral special. It can be slightly angled sideways in the same way as Snake's up-smash, and keeps momentum when used in midair. The seed then falls down and releases Stun Spores upon hitting a surface. The seed itself has decent vertical knockback, while the spores stuns any opponent in range, being able to punish opponents attempting to dodge Ivysaur. The seed can be reflected, though when doing so, the trajectory will be unaltered; it will just damage Ivysaur if it comes close to the explosion. Sunny Day 25% (each SolarBeam) Ivysaur summons strong sunlight, restoring 66% of damage and giving Ivysaur three SolarBeam charges. Cala - Ranked 3rd on the Florida Project M Power Rankings. Placed 13th at Smash 'n' Splash 4 and considered the second best Ivysaur player in the world. Machiavelli - Ranked 26th on the PMRank 2016. Miniboulet - The best Ivysaur player in France. Sabre - Ranked 8th in SoCal, and inventor of character-specific tech including the Flop Lock. Sothe - Ranked 10th on the PMRank 2017. Considered the best Ivysaur player in the world. Steel Kangaroo - Ranked 1st on the Colorado Project M Power Rankings. Todayyz - Ranked 2nd in Houston. Is considered to be the best Ivysaur in Texas. Tomo - The best Ivysaur player in Japan. Yoru - The best Ivysaur player in Mexico. Ivysaur now has more significant palette swaps to be more distinctive in Team Battles. In addition, she has received blue, purple, white, and black recolors. Ivysaur's Solar Beam has a 2D sprite (that comes from Suicune's Poké Ball move); unlike other objects with this feature, it won't keep facing the screen and will instead remain flat like Mr. Game & Watch. Solar Beam is one of only two moves that can be absorbed but not reflected, the other being Zero Suit Samus's down smash. Seed Bombs use the same graphic as Deku Nuts. Unlike Squirtle and Charizard, Ivysaur's Pokémon Trainer victory pose has not been replaced, making her the only character in the game with just two victory poses. In older versions of Project M, Ivysaur's Solar Beam was shot out of her mouth. Ivysaur's green color scheme is based on her Shiny coloration in the Pokémon series. This page was last edited on April 10, 2019, at 11:02.